Albumin-bound paclitaxel (abraxane, ABX) has more favorable efficacy and less toxicity than conventional taxanes. However, the data of ABX in advanced gastric cancer (AGC) treatment is unavailable. The current study was designed to summarize our experience in treating AGC patients with ABX. 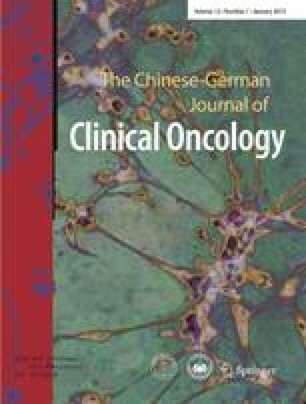 The clinical data of patients with AGC who had received at least one cycle of ABX-based chemotherapy in Sun Yat-sen University Cancer Center from January 10th 2010 to May 14th 2012 was retrospectively analyzed..
A total of 47 cycles of ABX-containing regimens, with a median of 3 cycles (range: 1–8 cycles), were administered to 14 patients. Five (35.7%) partial responses and 6 (42.9%) stable diseases were obtained, with a disease control rate (DCR) of 78.6%. The median progression free survival (PFS) and overall survival (OS) were 3.3 and 10.8 months, respectively. Interestingly, patients in the first-line setting achieved a DCR of 100% (8/8). Neutropenia and thrombocytopenia were the main grade 3/4 adverse events with an incidence of 50% in the whole group. However, only 25% patients (2/8) experienced grade 3 neutropenia when ABX in combination with fluoropyrimidines. The activity of ABX-based regimens as first-line therapy for patients with AGC is remarkable, and the toxicity is mild when ABX combined with fluoropyrimidines. Further prospective clinical trials of ABX-based chemotherapy as first-line treatment for AGC are strongly anticipated.